Rotolight’s NEO 2 was billed as an industry first upon its release last year: an LED panel married with high-speed sync capabilities (up to 1/800sec) and no recycle time. It’s proven popular ever since, finding its way into both the kit bags of amateur photographers and filmmakers and also on the sets of major movies. If you were a photographer who liked the convenience of always-on, shoot-what-you-see light, but also the power of a flash unit, here it all was in a single package. Indeed, there’s a reason it was the best on test in our recent round-up of LED panels. 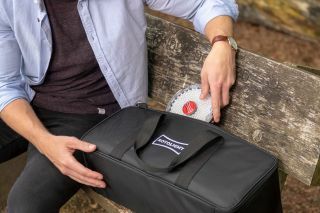 And now, with the new Explorer kit, Rotolight has emphasised the NEO 2’s usefulness for on-location shooting, making a three-light kit that weighs just 6.8kg, and all in its own carry bag. It represents a weight saving of 50% compared to the standard three-light hard case, and its material is resistant to water for greater security outdoors. The kit also includes light stands, colour FX filters and power supplies, and the lights come with a new suite of CineSFX effects and a range of modes for filmmakers (fire, lightning, TV, gunshot, paparazzi and others). "The NEO 2 has revolutionised how people use light," says Jason Lanier, a Rotolight Master of Light. "It can be used as both a modelling light and flash, and has eliminated the need for an external flash. If you have those moments that you just cannot afford to miss, this is an incredible light for you. You’ll never miss a shot." Jason also points out that the NEO 2 is a good choice for users of fast cameras like the Sony A6500, as its lack of a recycle time means it can keep up with the camera’s fast maximum frame rate of 11fps. The Rotolight NEO 2 Explorer Kit is available now, priced at £1,199.99/$1399.99. For more information, head to Rotolight's website. Read more: Rotolight's new Anova PRO 2 is "one of the brightest LED lights in its class"